March 14, world kidney day. This year was held under the motto “healthy kidneys everywhere and everything”. The company “B. B. NURA” was one of the sponsors in the screening of one school in Astana and the result is simply amazing! Thank you @Duman Turebekov for organizing. “Healthy kidneys everywhere and everyone” – under this motto this year is world kidney day. Astana hosted a scientific and practical conference, where the leading nephrologists of the capital discussed the problems of the industry and announced the results of screening studies. 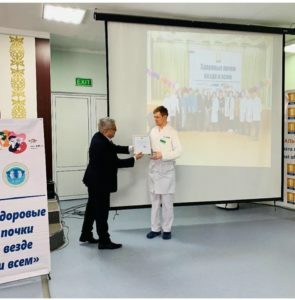 By the world kidney day, doctors examined Astana teachers free of charge to detect diseases at an early stage. With details – correspondent of the TV channel “WORLD 24” Nazar Akhmarov. In the auditorium of the school-Lyceum donate blood: the results of tests can identify teachers kidney disease. Some were not even aware of health problems. “Until we had a survey, I, for example, did not think that I have such huge health problems. Because nothing bothers”, – says Zaure dzhunusova, teacher of Russian language and literature school-Lyceum №62. Free to test teachers of Astana have decided the main nephrologist of the city of Duman Turebekov. He also found sponsors for the action. “Because of their employment, daily psycho-emotional load, they can not come to our clinics, and today we have come ourselves. To carry out such an action, to help diagnose their diseases, to determine whether their kidneys are healthy,” Turebekov said. Of the 102 surveyed teachers of kidney disease in 56. Statistics figures were announced at the scientific-practical conference. “The results in this small study group shocked us. Because more than half of the staff at this school have chronic kidney disease. From 1st to 3rd stage. This, of course, is a lot,” – says Tatiana Tsoi, assistant of the Department of internal diseases of the Medical University of Astana. The main thing is to diagnose the disease in time, doctors say. Modern medicine allows not only to slow down the course of the disease, but also to stop it.